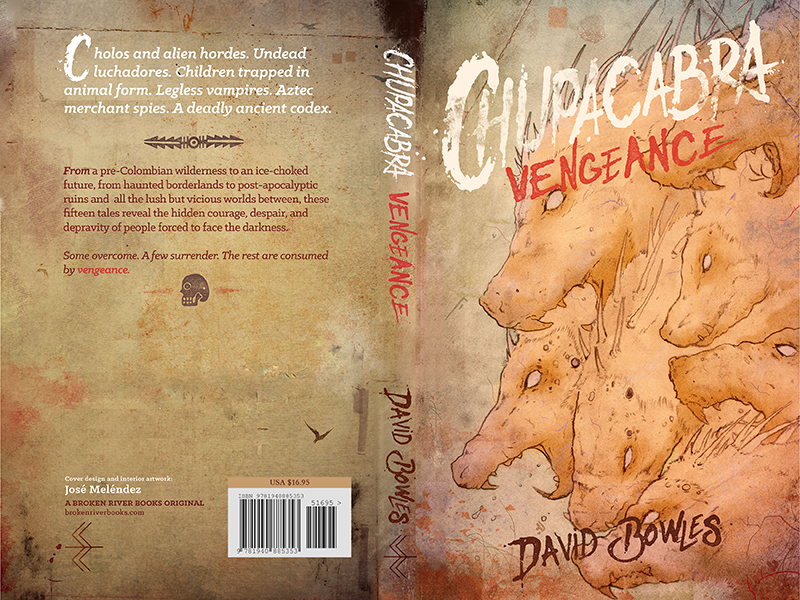 We’re now just days from the release of Chupacabra Vengeance, so I wanted to show you the full wrap-around cover in all its glory. Cholos and alien hordes. Undead luchadores. Children trapped in animal form. Legless Vampires. Aztec merchant spies. A deadly ancient codex. From a pre-Colombian wilderness to ice-choked future, from haunted borderlands to post-apocalyptic ruins and all the lush but vicious worlds between, these fifteen tales reveal the hidden courage, despair, and depravity of people forced to face the darkness. Some overcome. A few surrender. The rest are consumed by vengeance.